Custom mobile app development on Kotlin programming language offers many advantages. First, the main aim of JetBrains was to make it as quick as Java and easy to learn. And they managed to do that.) Second, Kotlin provides lean syntax, extensions features, null-pointer safety, and infix notation. One of the strong and important things there is the fact that Kotlin language came from the industry, not academia. It was developed to solve programmers’ difficulties and operational challenges. 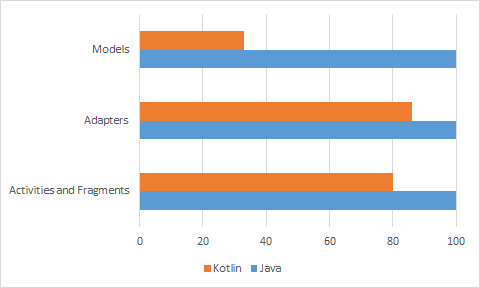 The results were expected: we got Kotlin code, on the average 20-25% less than the same on Java. So, we made sure that Kotlin language allows writing more elegant and concise code. This is the most visible in model classes as Kotlin Properties allow to dispense with getters and setters. Product development on Kotlin gave us even more pleasant impressions. We believe that Kotlin Android Extensions should be described first of all. Every Android app developer knows well a findViewById() function. Without a doubt, it’s a source of potential bugs and nasty code which is difficult to read and support. 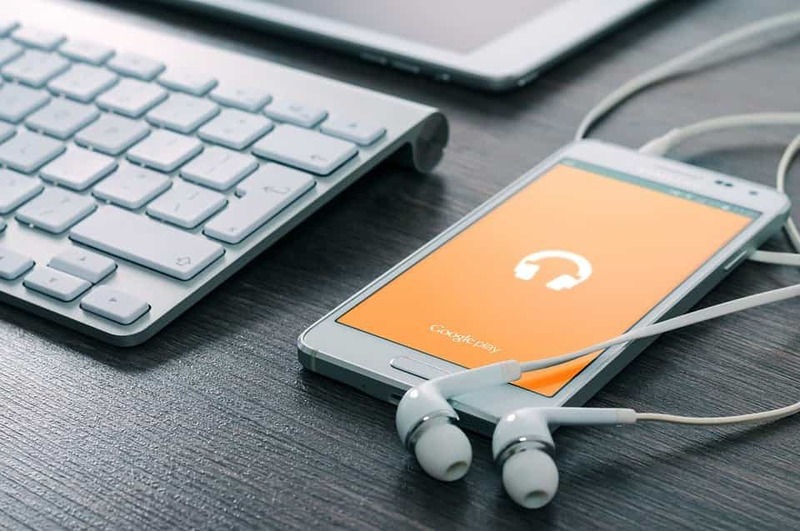 While there are several available libraries that provide solutions to this problem, there are libraries dependent on runtime and requiring annotating fields for each View. Also, a Kotlin Android Extensions plugin enabled us to obtain similar experience we had with some of these libraries, without having to add any extra code or shipping any additional runtime. In Kotlin class developers can directly use a view’s id without additional initialization or leading to the required type as this language will take care of it itself. So, as an example, there is no necessity to use ButterKnife library for dependency injection. Someone may object that listeners’ initialization takes a lot of place and looks unattractively while the very ButterKnife allows eliminating this problem. Nevertheless, here Kotlin programming language successfully copes without third-party libraries: Lambda expressions and inline functions provide everything you need to write a concise, intuitive, and perfectly working code. In our custom mobile app development, we used a lot of utility classes for not to load Activities and Fragments with extra logic. For example, to completely implement the display of Toast system message throughout the application improperly. That’s why we moved this in the utility class. However, to display this message, developers have to always transfer a Context system object. Thanks to Kotlin Extension Functions we can add a method to a Context native class. Thus, we received positive impressions from writing in Kotlin thanks to the advantages and smart introductions it provides engineers with. We believe in the potential of this programming language and plan to continue gaining experience in our custom mobile app development. 1. Lean syntax. One line functions and simple structs generally take one line, functions can exist outside of classes., which helps to get a readable and intuitive syntax. Kotlin variable declarations and parameter lists have the data type come after the variable name like it are in Scala, Go, Pascal, PL/SQL, etc. 2. Null safety. This allows the compiler to systematically flag potential null pointer dereferences. Also, Kotlin programming language doesn’t include an option type. 3. Functional programming support. Provides zero-overhead lambdas as well as the possibility to make mapping and folding over standard Java collections. 4. Extension functions. They allow mobile app developers to add methods to classes without modifying their source code. Also, extension functions enable us to easily discover new methods via auto-completion, implement existing Java APIs with other Kotlin features, etc. 5. Companion objects. Unlike Java and C#, Kotlin language classes don’t involve static methods. Instead, they offer package-level functions. For example, if you need to write a function with the ability to call it without having a class instance, you can make it as a member of an object declaration inside this class. If you declare a companion object inside the class, you can call its members with the same syntax as with static methods in Java or C#. 6. Low risk in adopting Kotlin. This is a concise and easy-to-learn programming language which can be easily adopted in your company. One of the strong points is that Kotlin classes export Java API which generally looks the same to that of Java code. Today, Kotlin is developing by leaps and bounds. Some even predict that soon it will become the main language in Android app development. If you have some issues or have a project idea, feel free to apply to us and receive smart recommendations!